José Ordovas sips a mint tea in a languid café in Madrid, Spain. His eyes scan two mobile phones as he confirms his next appointments. In conversation, he switches effortlessly between Spanish and English to find the right expressions. If the geneticist seems to be moving on a different wavelength from the other patrons, he could blame it on the jet lag: he has just flown from Boston where it’s now 5am. This is his third overseas trip this month, but Ordovas contends his frequent visits from Tufts University, where he’s based, to Europe have no adverse effects. “For me the time difference doesn’t matter, I’m up at 4am to make calls to Europe when I’m home anyway, and then I’m up late on calls to California,” he says. Ordovas embodies the hustle and bustle of the ‘big science’ approach that has changed nutrition research in the past decade. This field, once confined to small groups of researchers studying the effects of single nutrients — such as particular vitamins or proteins — on a few dozen volunteers, is now adopting the heavy-lifting tools developed for genetics and pharmaceutical research. It also has a catchy name: nutrigenomics. And the more that researchers learn how our genes interact with our diet, the more they appreciate the deeper insight gained by an interdisciplinary approach. Such knowledge could lead to breakthroughs in our understanding of risk factors for diabetes and cardiovascular disease or, for example, improve the design of weight-loss diets. Nutrigenomics is starting to reveal that a person’s diet is more than the number of calories they eat or the ratio of proteins to carbohydrates or fats. Those are important, but the analogy of human metabolism as a car engine that requires a certain type and amount of fuel does not hold up in the age of whole-genome analysis. Nutrition researchers are realizing that our diet does more than just fire our pistons. It is as if the fuel we consume can reach out from the combustion chambers in the engine — through the genetic pathways that govern our metabolism — and tune the engine mid-race. Multiply those fine adjustments by every possible mutation in each gene of the human genome, perhaps 10 million tweaks in total, and you have an idea of the scale of Ordovas’ task. “The only way to realize this concept is via big science,” he says. Ordovas studies how food influences cholesterol and other cardiovascular health indicators in large groups of people. “You take large numbers of individuals with a well-characterized diet,” says his collaborator John Mathers, a nutrition scientist at the University of Newcastle, UK, “and you do a genomic study to ask the question: how does diet interact with the genome to produce a particular phenotype?” Cardiovascular health might be nutrigenomics’ strongest application to date, Mathers says, but researchers are also beginning to study the long-term effects of nutrition on the brain and on ageing. Answering these questions requires examining how small genetic mutations, called single nucleotide polymorphisms (SNPs), affect the production of enzymes and hormones that control metabolism. There are thousands of these mutations in each individual and countless feedback loops, meaning that researchers in the emerging area of metabolomics must employ sophisticated bioinformatics models. “A lot of those tools were developed for pharmaceutical studies and now have become almost commonplace in all areas of biology, including nutrition,” says Mathers. Progress in pharmaceutical research has stimulated improvements in microarrays, high-throughput sequencing, polymorphism identification and DNA methylation technologies, used to scan for novel receptors that might respond to potential drug molecules, says bioinformaticist Chris Evelo of Maastricht University in the Netherlands. In large clinical trials, researchers often collect information about multiple levels of an individual’s health before and after the trial in case a drug targeting the heart has an unanticipated effect on the liver, for instance. Likewise, nutrigenomics specialists are concerned with the broader effects of any experimental dietary intervention. “This system-wide approach has been the rule in nutrigenomics research all along. There often are no clear target genes for diet changes,” says Evelo. This problem forces researchers to seek out subtle interactions among many elements of the metabolic system and related genes. Exploring the theme of gut health as influenced by both genetics and the microbiota. Around 200 people attended from 19 countries. An overarching theme of metabolic health, with sessions on biomarkers, modelling tools and personalized nutrition. Around 130 people attended. Discussions centred on the interaction between diet and genes, and how this enables personalized health and disease prevention, particularly in Latin America. An invitation-only event that jointly addressed issues of nutrition and immunity in the developing world. 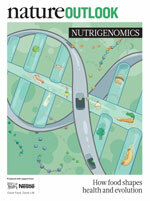 Reviewing developments in the related fields of nutrigenomics, nutrigenetics and nutriepigenomics, in disease prevention. Nutrition researcher Lynnette Ferguson at the University of Auckland in New Zealand has experienced the move towards more pharma-like genome-wide intervention studies. She notes that, as recently as 2003, she and her colleagues were “talking about single genes, single nutrients.” Yet many promising treatments based on single molecules had clear effects in the lab but never passed animal trials. This is because, as Evelo says, “if you push the system in one place it will compensate through another mechanism and in the end the wished for effect does not occur.” Since then, rapid improvements in microarrays and ‘deep sequencing’ technologies have enabled researchers to consider the impact of food down to the level of individual SNPs. It has also given them a more objective tool to measure what volunteers are actually eating, rather than relying on self-reporting. Adopting technology from outside traditional nutrition science means adopting new research methods. “My own advantage was that I had been part of a cancer research programme,” says Ferguson. “I’ve watched the development of pharmaceuticals, seen my colleagues work with them and seen the sorts of models they use.” Ferguson’s team used high-throughput sequencing to screen human cells for modifications to the interleukin-12/23 receptor pathway — important for bowel health — that they suspected were caused by certain foods. This work helped them develop a cellular assay for measuring the effect of particular food components on gene expression in human cells. The next step is to validate whether such nutrient-genome interactions exist in animal models, before planning human trials, just as if they were testing a new drug. These tests will not be straightforward as not all people respond to dietary changes in the same way that not all people react to a particular medicine. Identifying different populations based on their genetic responsiveness is starting to show promise, according to Ordovas. In the best case scenario, researchers would screen individuals against panels of genetic risk factors. In the case of cholesterol, Ordovas and colleagues have found specific genetic differences between people whose cholesterol levels are affected by changing their diet and those who only respond to medication. Right now, doctors try patients on multiple diets before prescribing cholesterol-reducing drugs to avoid side effects. But with a reliable genetic screening test, doctors could prescribe drugs to patients unlikely to respond to dietary changes, saving time and helping reduce the harm caused by living with elevated cholesterol levels. The majority of dietary effects are subtle, however, and certain genetic profiles might be relatively rare and more difficult to screen. This requires large cohorts to detect and identify signals. “In any gene, there are a few key polymorphisms that we scan, but others will be less common, may not be on the chip we use, or in the specific ethnic group that we are studying, but could still cause disease,” says Ordovas. That means he may need to scan ever-larger numbers of volunteers — perhaps into the hundreds of thousands. Unlocking the massive datasets that will emerge will, of course, require dozens of researchers — outnumbering the volunteers that participated in Ordovas’ studies in the 1980s (a fact he mentions when he gives presentations about this burgeoning field). Adapting pharmaceutical technologies to food isn’t the only challenge for researchers: “it’s also how you deal with all that data,” says Evelo. Some computer models aim to describe observations whereas others try to replicate or predict. “We are trying to integrate those two approaches,” says Evelo. This could help researchers working on different facets of the same problem to better understand one another’s results, forge new collaborations, and help trace biological problems from the point where food molecules interact with the transcriptome to the symptoms that are presented in a doctor’s examination room. As a proof of principle, the NuGO team used dbNP to track the development of human-like insulin resistance. Evelo and colleagues fed mice a high-fat diet and performed genome-wide transcriptome analysis, tissue sampling, plasma sampling and proteome analysis. They observed that the first signs emerged in a type of fat tissue. This finding neatly explains previous studies that suggested the ratio of saturated to unsaturated fatty acids affects whether a person develops insulinresistance. In addition to the database, there are a slew of new meetings (see Meeting of minds, page S4). Ferguson established an annual retreat to help New Zealand’s nutrition and genomics researchers, from academia and industry, find common ground. “I feel that the slight tension between different priorities [in these groups] has actually been a benefit,” says Ferguson. One resulting food developed from genetic research on Crohn’s disease is a bread less likely to inflame an irritable bowel. Nutrigenomics researchers also make the most of social networking to stay in touch. One researcher uses the Twitter handle @nutrigenomics; Ordovas and Jim Kaput, head of the FDA’s personalized medicine division, often make Skype calls during the weekend. If this side of big science sounds a bit like cultivating a long-distance relationship — it is, says Ferguson. Selecting collaborators at first was “like early dating situations: did we want to work together? Did we want to work with other partners?” Now that funding is available, there are many more people expressing an interest. Ferguson and collaborators must now ask the hard questions of ‘what’s your skill set?’ and ‘what can you contribute?’ before inviting would-be partners on board. The near-term future of nutrigenomics is almost certain: researchers are already hustling to persuade government and funding bodies to finance follow-up studies on the latest research by asking the same questions but on a more ambitious scale — testing hypotheses derived from cell cultures in animals and humans. Some researchers question how useful individual nutrition advice will be in the near term. “Personalized nutrition advice may not be helpful to the general public if they don’t know their own genetics,” says Albert Koulman, an analytical chemist at the Medical Research Council in Cambridge, UK. But consumer genomic analysis provokes more questions, such as who pays, who gets the results and whether it affects health insurance rates. “There’s much more than just the biology, there’s the business side and the ethics. We’re still just scouting scenarios,” says van Ommen. Commercial pet food today may be a preview of the kind of food categories humans might find in future markets, according to Kenneth Kornman, head of InterLeukin Genetics. “Pet foods I get for my dog are age-categorized, or categorized by sensitivities such as gastrointestinal problems,” he says. Dietary needs for individuals also change over the course of their lifetime and from one group of people to the next. Food manufacturers could one day offer the same choices pet food makers do today — with the additional cost of ensuring that the food is safe for human consumption. There is a big cost to launching such a food, notes Kornman. “You’d need to have a reasonable idea that you’ll earn it back.” Yet few companies know how to market genetically customized nutrition to customers or how to successfully patent a diet consisting of widely available foods, he says. Measuring that will require understanding more than just the chemistry of our food or the on–off switches of our genes. “We’ve started to better appreciate the fact that it’s not just the diet and it’s not just the genetic factors but it is an interaction of the two that permits a metabolic change that gets translated in a complex disease over time,” says Kornman. It may be a tricky tune to follow, but nutrigenomics researchers are all ears. First published in Nature Outlook: [html] [pdf].